I brand myself "The Thinker" as my moniker because I'm interested in many intellectual topics like science, philosophy, history, and religion. Being a person preoccupied with creating coherent metaphysical and ethical views has more and more recently created a bit of a dilemma for me. And that dilemma is over my consumption of meat. I've been thoroughly omnivorous virtually my entire life. I did go vegetarian for 1 month about 10 years ago but I just couldn't keep it going. But recently, over the past few years, I had started becoming increasingly aware of the things that go on behind the production of the meat that I had been eating and enjoying. This awareness has forced me to seriously reconsider if I can go on justifying my consumption of meat, and to be quite honest, it is driving me a little crazy. My ethical views, if taken to their logical conclusion, would force me to become at least a vegetarian. An organism's sentience—its capacity to suffer, is what my ethical views say denote a moral connotation with regards to its treatment. Animals like cows, pigs, chickens, deer, ducks, lambs, and many other commonly consumed species, all have to varying degrees, complex brain structures and nervous systems. They react to pain and stimuli just as any human being would. In short, they have all the hardware necessary to feel pain and be consciously aware of it. And if it is wrong to harm a human being because of its capacity to feel pain and to suffer, then it is also wrong to harm an animal because it too has the capacity to feel pain and to suffer. This has lead me to a position where I am unable to justify my consumption of meat, especially given a system where I have no idea where my meat is coming from and in what conditions the animals were treated before they were killed for their meat. Every dollar I spend and every ounce of meat that I consume is contributing to and fostering the daily atrocities going on in modern factory farming, and I do not want to support such an industry. So I'm left with only one choice: I must make a lifestyle change. Let me tell you that change has been hard. Over the last few years I've dramatically cut down on my meat intake. I started with eating less beef. Cows are very large mammals, and they need an awfully lot of food (and antibiotics) in order to grow big enough and meaty enough for them to be ready for human consumption. I had already switched from dairy milk to almond and soy milk several years ago. I made it a point where having beef became a rare event—a luxury I'd treat myself to once in a while. I eventually did the same thing with pork, even though I loved ham, sausages, and bacon—oh sweet, delicious bacon. But my problem was with chicken. I had been eating chicken almost every day. I didn't even think twice about it until recently. Then a few months ago my coworker told me he went vegetarian. I was impressed. He used to eat lamb over rice from the halal cart every week, and now suddenly he had gone completely vegetarian. I had been leaning in that direction for some time but I thought that perhaps this could be the impetus for me to completely rescind meat consumption altogether. 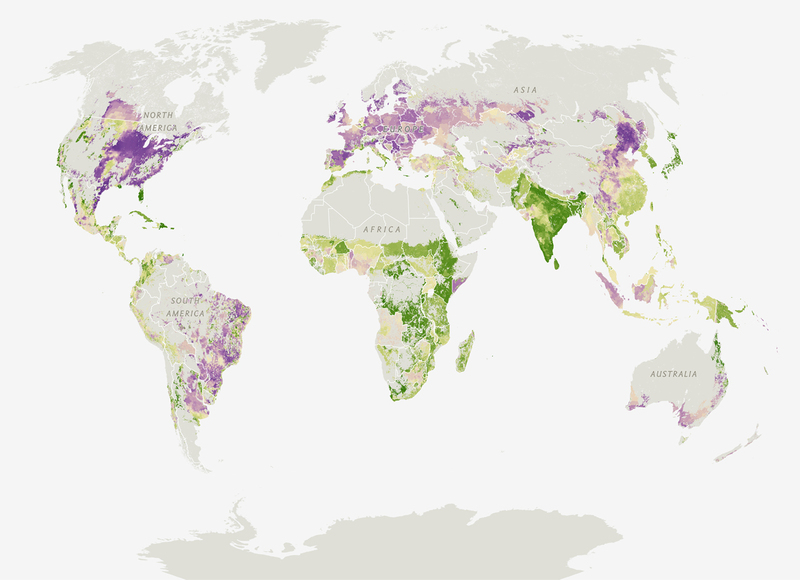 The map below shows the farmland in purple devoted towards growing feed for animals that we consume versus the farmland in greed devoted to food directly for human consumption. Note that in the US, most farmland is devoted towards animal feed. I flirted with being a pescatarian for a while, since I do enjoy fish. I do think fish capacity for sentience and pain is not as high as it is for mammals like cows and pigs. And, I reasoned, as long as I don't eat fish a lot I should be OK. Overfishing is a big problem and the world's growing appetite for seafood is outweighing nature's capacity to provide. A 2003 report showed that overfishing has resulted in the number of large ocean fish at just 10 percent their pre-industrial levels. So for the ethical consumer, eating large amounts of seafood like fish is contributing to this devastation and is therefore immoral. So where does that leave me? Well for one thing, my ethical views cannot afford me the mindless consumption of meat I once enjoyed. I must be a conscious consumer, and that requires a lifestyle change. I have several options in front of me. On the one extreme is veganism—no meat, fish, dairy, or any animal by-products whatsoever. That includes no leather made from cow hides or any other animals. A little to the center of that is vegetarianism, which would allow for dairy foods like milk and eggs, and by-products made from animals. To the center of that is pescatarianism, where the only meat that I eat is fish. To the center of that is a situation where I eat fish, but occasionally eat some other meats, like chicken. And then further down the spectrum to that would be the occasional eating of cows, pigs, lamb and the like. Even so, ethical standards would be maintained, like making sure that the animals were free range, and free of hormones, etc. This is quite a wide spectrum. And I'm not even close to veganism, which I think would be ideal, but a very difficult stretch. Right now I am almost at the point of being a pescatarian, who occasionally eats chicken. But even that I am seriously cutting down on. I am planning on turning my intake of chicken to the rarity that I had for beef. I plan on making it a very rare occasion for me to dine on poultry with the eventual goal of getting off of it entirely. There are plenty of good vegetarian options and I recently became enamored with veggie burgers. I leave you with some advocates for the cause for increased ethical standards of our treatment of farm animals and for a more sustainable future.